Collar covers, bandanas, and coats for dogs with special needs like deafness, blindness, both, or shyness. What a great idea! Now when you’re out in public, people can clearly see that your dog has an issue and approach appropriately. It also creates an opportunity to educate others about dogs with special needs—how to approach them, that they can be trained, and that they can make wonderful companions. 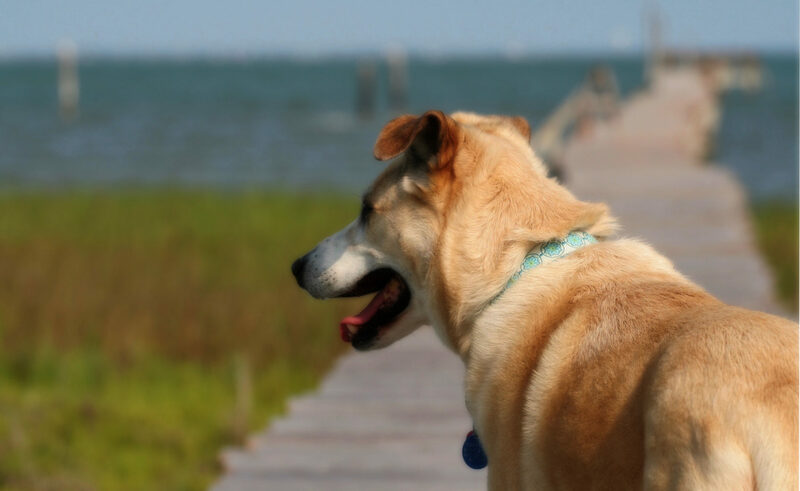 Do you have a harness/collar you recommend for a dog that is totally blind. She keeps running into objects that she cannot see. I tried emailing you, but it bounced. There are also dog helmets available. I have a totally blind dog who has developed seizures from the head tramua of running into objects. I saw the hoop and it looks ackward. The helmets, one even has “whiskers”, on handicappedpets.com look more liveable. I need the red coat with bright yellow lettering that says “I’m Deaf”. PLEASE let me know where to purchase one for my Great Dane. Hello, my name is Justina Tynes and I am with a 501-3c rescue organization, Australian Shepherd Advocates. A national organization that trains, covers medical, and even transports dogs to their adoptive families. In addition to the above, we also save dogs that most other rescues will not. Deaf, blind, deaf AND blind, tripod and other special needs. 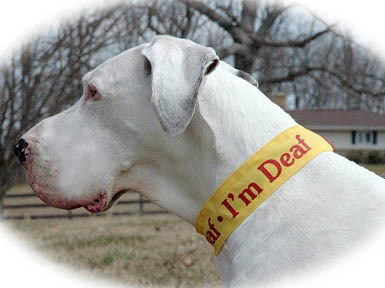 We teach sign to the deaf, touch train the blind and deaf prior to adoption. We are inquiring if you have any items that you would be willing to donate to ASA for our fund raiser. As a rescue, this is how we are able to continue to save the lives of dogs. Thank you in advance for your time and consideration. I look forward to hearing back from you soon.